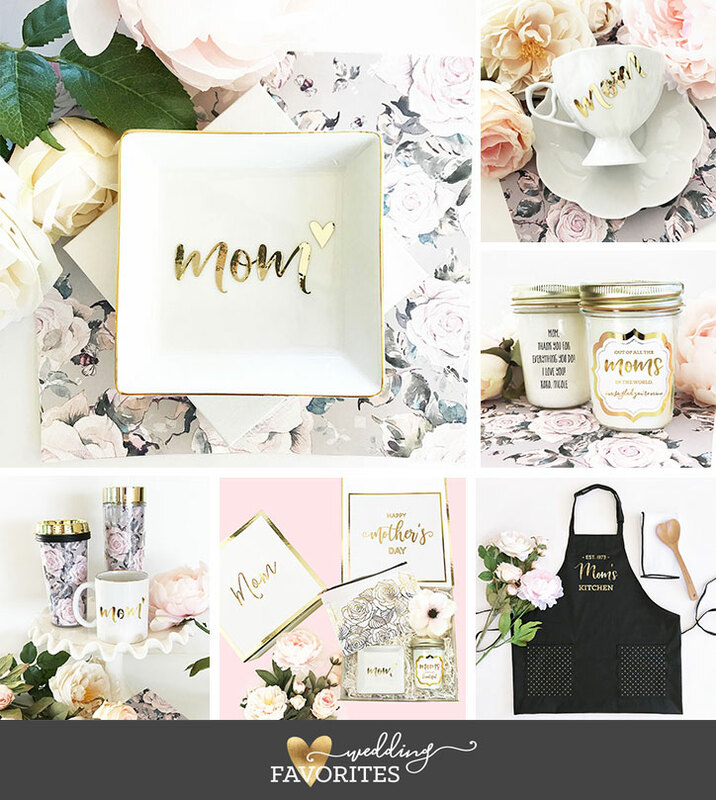 Looking for pretty and practical gifts for mom? Well, we have you covered! Our new Rose Garden Mother’s Day collection is now available with beautiful rose patterns your mom will love. We’ll go over a few gift and packaging ideas that will make her special day all the more special! 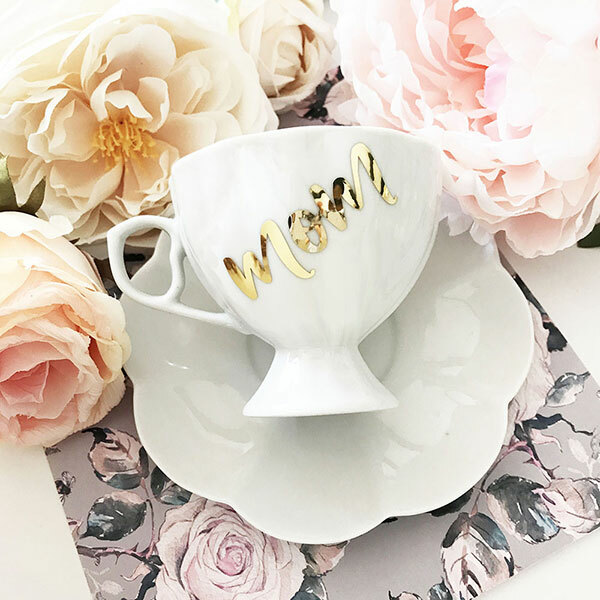 Personalized teacups make a fun and practical gifts any mom would love! Each porcelain teacup comes in your choice of three personalized styles and a matching saucer. Choose from one of our fun preset text lines, a beautiful gold monogram, or one short word of your choice! If you’re looking for something vintage with a little flash to match your mom’s personality these are just for you. 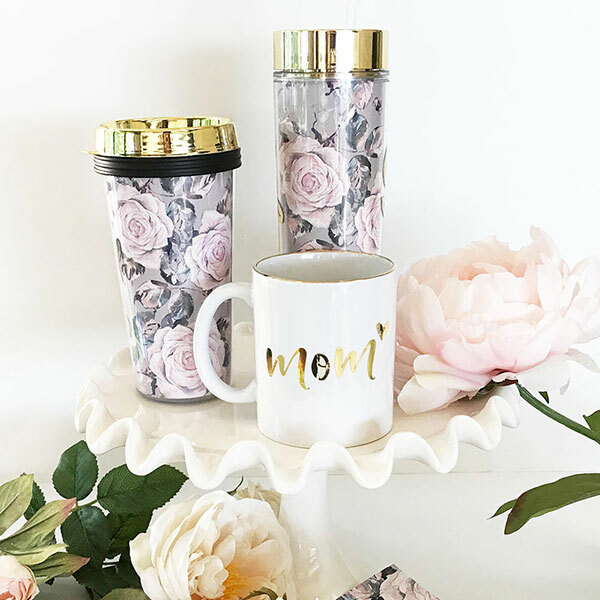 Mom coffee mugs are a perfect gift for the mom obsessed with coffee! Each ceramic mug comes with a shiny gold rim and is personalized with “mom❤ “in a beautiful gold vinyl. For a fun DIY gift, just add a small pack of her favorite grounds inside the mug and place the items in a cellophane bag. Don’t forget to finish it off with a ribbon of her favorite color for a fun gift she will love and enjoy every morning! Mom ring dishes make a unique and practical gift! 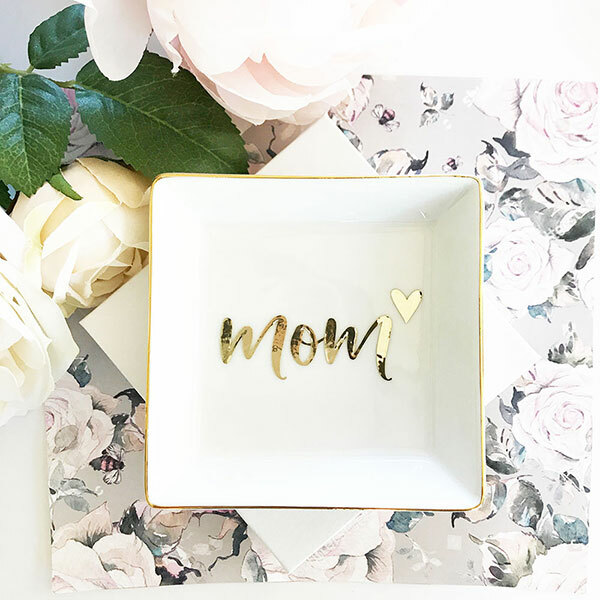 Each ceramic ring dish comes in your choice of white, pink, mint or black and is personalized with a beautiful high-grade metallic gold “mom❤ “vinyl. These sparkly ring dishes are the perfect size to place next to a nightstand table for rings, earrings and other small jewelry before bed! 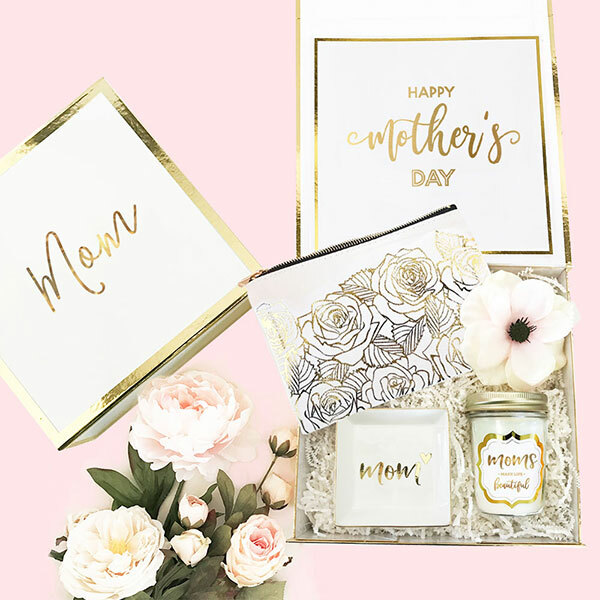 Choose to add our signature gold heart gift box and your own personalized note for a complete gift your mom will cherish. Light up your mom’s life on Mother’s Day with a beautiful personalized mason jar candle just for her! 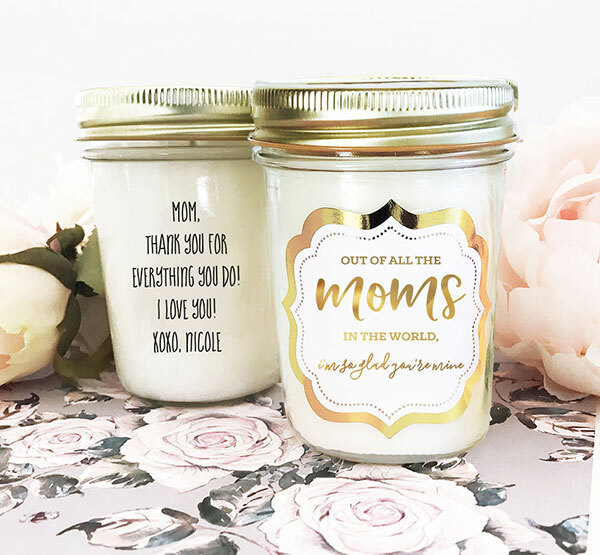 Each candle comes with a mom-themed gold foil label on the front and a gold foil dotted label on the lid. Candles are made of 100% soy wax and have a floral/citrus scent your mom won’t be able to put down. Don’t forget to choose to have the backside personalized with a custom message of your choice and finish off the perfect gift with a pretty gift box! 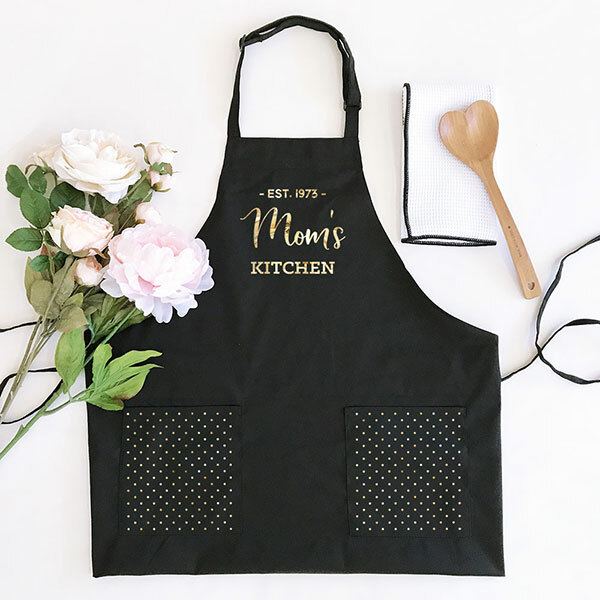 Personalized women’s aprons make a fun and practical gift to thank your mom for all the hard work she puts into your meals! Each apron comes in your color choice of white or black with an adjustable neck strap, two pockets and customized with the text of your choice. Add a beautiful polka dot pattern to the pockets in the same text color option for a completely chic look! Personalized gift boxes are a special way to package gifts for Mother’s Day! Each elegant white gift box comes in your choice of two personalization styles with shiny gold edges. Choose to add an inner card with a preset short message and paper shred for a complete personalized look your mom will love! If you are looking for the perfect gift don’t forget to check out our Mother’s Day Gift Collection. To make things easier, Wedding Favorites has everything you need to plan a unique event. Find the latest décor kits, personalized banners, and more! Make sure to sign up for our NEWSLETTERS to get future updates, coupons, holiday printable and more! Follow us on Facebook, Instagram, and Twitter for more updates.